The hotel is located on Zion Square, in the heart of Jerusalem’s city center. The new KOSHER ibis Hotel is just a minute away from the Old City, Ben Yehuda Pedestrian Mall, the tram station, and is an ideal base for exploring and enjoying Jerusalem’s important sites. Located at the bustling heart of Jerusalem, a city that has influenced the world for millennia, the exclusive Herbert Samuel Hotel draws its inspiration from the many ancient, modern, Israeli and international sites that surround it. The ambiance of the hotel and its famous gourmet restaurant evokes an exhilarating Jerusalem experience that is at once contemporary and authentic. Shani Hotel offers a relaxing experience and a unique stay in larger rooms and suites of all hotels in Jerusalem. Its contemporary decor, mahogany furniture, wooden floors and varnished wood materials create a pleasant, warm and intimate atmosphere, a true invitation to well-being, and travel. The Eyal Hotel is a four star, boutique hotel in the heart of Jerusalem. Perfectly located next to Ben Yehuda Street and only a several minute walk to the Old City, guests enjoy easy access to some of Jerusalem's finest dining, shopping, and holy sites. Located in the heart of a vibrant and magical holy city, Agripas Hotel exudes the mystery and exoticism of another world. This is the ultimate escape, a cool haven of discovery and pleasure. Agripas Hotel is a luxurious experience, evoking a sophisticated, chic ambiance with discreet and effortless service. Small boutique hotel located in the center of Jerusalem in the heart of the Ben- Yehuda pedestrian mall. 54 charmingly designed rooms featuring romantic colonial design which pays tribute to the early 20th century Jerusalem’s life. 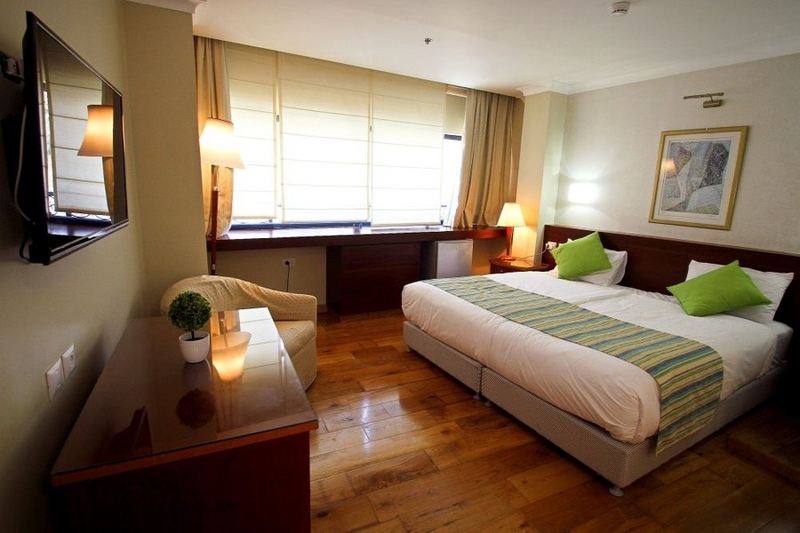 Eldan Hotel is located on the luxurious and pastoral King David street. With comfortable prices and its central location, only a short walk away from the Old City and Jerusalem's vivacious downtown district, Eldan Hotel is an excellent choice for guests looking to enjoy Jerusalem's lively nightlife, and the many attractions and restaurants of central Jerusalem. The Dan Panorama Jerusalem Hotel is centrally located in the new part of the city, within easy reach of modern Jerusalem's lively center, theatres, shops and businesses, whilst it is still within walking distance of Jerusalem's major historic sites and the fascinating Old City. Harmony Hotel is a modern boutique hotel located on the vivacious Nachalat Shiva'a street in Jerusalem's downtown area, a short distance away from all of Jerusalem's main sites. Nachalat Shiva'a street, a beautiful picturesque pedestrian promenade, is a historical Jerusalem street, strewn with shops, cafes and restaurants, an attractions for both locals and tourists alike. The Jerusalem Inn Hotel is perfectly located in the center of Jerusalem, at 7 minutes walk from the Jaffa Gate and the historic Old City and steps away from Zion Square and the Ben Yehuda promenade and shopping street, a station of the new light rail service nearby. The Jerusalem Tower Hotel is located right at the heart of Jerusalem, on the bustling downtown Hillel street. The hotel is surrounded by numerous cafes, restaurants, bars and various shops. A few minutes on foot will also bring you to the Old City of Jerusalem and all its historical and holy sites. The elegant Leonardo Plaza Hotel, once the Sheraton Plaza Jerusalem, is located at the heart of Jerusalem's city center, across from the Great Jerusalem Synagogue, and only a short walking distance away from the shops and restaurants of Nachalat Shiva'a district, and the colourful Ben Yehuda Midrachov. Montefiore Hotel is a small, but unique boutique hotel, located on Shatz street, at the heart of Jerusalem's downtown district. Only a few minutes walk from Jerusalem's main historical and religious sites, Montefiore Hotel is ideal for any tourist or buisness traveler looking for a quiet stay, with the advantage of a central location. Palatin Hotel's location is perfect for tourists looking for the feel of Jerusalem, and want to experience the exuberant atmosphere of downtown Jerusalem. The hotel is located at the bottom of Agrippas street, lately transformed into a trendy pedestrian promenade, closed for traffic, boasting many unique shops and restaurants. The Prima Kings Hotel, restored in typical Jerusalem style, has been a landmark in the posh Rehavia district for decades.The hotel features on–site meeting / seminar rooms, a Glatt Kosher dining room and the Café Paris coffee shop, synagogue and excellent amenities. The Prima Palace Hotel is a part of the Prima Hotels chain in Jerusalem, offering a unique blend of modern surroundings with traditional atmosphere, catering mostly to religiously observant visitors. The Prima Palace Hotel is located inside the Jewish orthodox neighborhood of Me'a She'arim, only a short walk from the Old City.